Boycott Bowl $57,000 check turned over to New Orleans Recreation Department Foundation. NEW ORLEANS — After their team's Super Bowl dreams were shattered, New Orleans Saints fans united and threw the biggest Super Bowl party. Thousands of fans donned their black and gold regalia and marched, danced, screamed and partied like they would have if the Saints had advanced to the Super Bowl. And in the process, they raised money for a local organization. Both New Orleans Mayor LaToya Cantrell and council member Helena Moreno spoke at the check presentation ceremony. The event was organized in two weeks and attendees were asked to make a $10 donation on showsparker.com. Aprés Lounge and Ernst Café joined to offer VIP opportunities and within five days the event was a sellout. 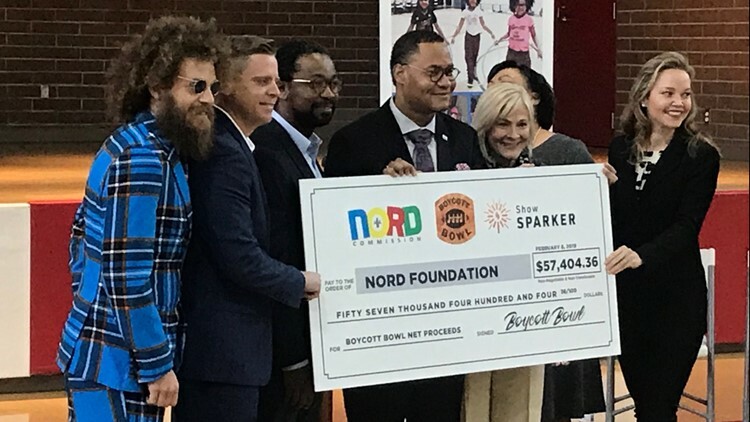 “As a former athlete at NORD's Harrell Playground in the 17th Ward, this makes me so excited to have helped raise this much money for the NORD Foundation," Boycott Bowl co-founder Walter Williams Jr. said. The event featured more than 15 musical acts including Fred LeBlanc from Cowboy Mouth, Louisiana Music Hall of Famer Dash Rip Rock, Rockin’ Dopsie Jr., Partners-n-Crime, Flow Tribe, The Vettes, Big Freedia, Shamar Allen, and the Brass-a-Holics. "We stole the show from the biggest show in the entire world. These two weeks have made me cherish being a born, raised and current New Orleanian!,”Boycott Bowl co-founder Travis Laurendine said. Moreno thanked event organizer Brandon Rizzuto and called on him to continue to build the "Boycott Bowl" into an annual event - as if New Orleans needed another excuse to throw a party. "All that I ask now, is that we build on this event. That Boycott Bowl doesn't end today with this check. That Boycott Bowl continues to grow throughout the years," Moreno said. Stay with Eyewitness News on WWL-TV and WWLTV.com for more updates o this story. Paul Murphy contributed to this report.